Hunger Notes believes that its readers should do three things: Learn about hunger, contribute financially to reducing hunger, and use their citizenship (U.S. or other country) to influence government policy (U.S. or other country) to benefit poor and hungry people. This article describes RESULTS, an effective anti-hunger organization whose members take political action to help poor and hungry people, and which Hunger Notes believes is worthy of your participation. (February 29, 2004) RESULTS is a nonprofit grassroots advocacy organization that is committed to helping concerned individuals exercise personal and political power by speaking powerfully to help stop hunger and poverty. It consists of a domestic and worldwide network of members. The domestic network consists of more than 900 volunteers from over 100 communities across the nation. Internationally, there are RESULTS organizations in six other countries: the United Kingdom, Germany, Australia, Japan, Canada, and Mexico. U.S. members take the initiative to write letters to their Congresspersons to inspire them to help make changes to legislation to benefit hungry people and to generate media coverage of key hunger and poverty issues. RESULTS has three categories of membership as described further below. 1) Microenterprise Credit. RESULTS has been the principal political force behind the strong U.S. government support for microenterprise credit, which has permitted establishment of microcredit loans to very poor people throughout the world. This approach was begun by Mohammed Yunus in Bangladesh, and was mainly focused there before RESULTS. Microcredit lending makes loans to poor people so that they can invest in their productive small enterprises, such as retail sales, and thereby earn increased income. Poor people repay the loans, which can then be reloaned to other poor people. RESULTS recognized the benefit of this approach, and through its legislative efforts in the United States, in the six other countries where it had chapters, and internationally through its work influencing the World Bank and other international financial institutions. From a beginning in one country, Bangladesh, microenterprise credit has become a key way of assisting the world’s poor people. 2) Child Survival/Health. RESULTS has supported U.S. and worldwide child survival and health assistance throughout the existence of RESULTS, which began in 1985. Health assistance was approximately $135 million when RESULTS, along with Bread for the World, began support. It is now $1.835 billion. RESULTS efforts played a key role in this increase. RESULTS focus now is on increasing funding for the Global Fund to Fight AIDS, Tuberculosis and Malaria, which provides direct assistance to poor countries and people, including antiretroviral drugs to prevent the progression from HIV infection to AIDS. In the United States, RESULTS members constantly lobby for funding for programs such as Head Start, WIC, and the Child Care and Development Block grant, which are dedicated to improving the lives of millions of resource poor children. They are also working on asset development for the poor in America through programs including microcredit and Individual Development Accounts. These tools help families to save and invest their money to buy their first home, pay for post-secondary education, or start a small business. There are three ways to join RESULTS. 1) You can partner with a RESULTS group near you. In doing so, you can participate in national conference calls, in writing monthly letters, and in having the opportunity to meet and connect with other partners to participate in local actions and events. 2) You can also become a member by contributing $35 or more. 3) You can become a financial contributor. If interested, please contact RESULTS at info@results.org. For more information about RESULTS, visit them at www.results.org . 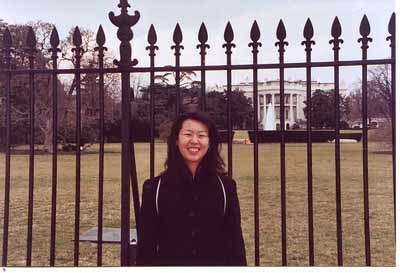 Mabel Ng was World Hunger Education Service intern for Spring, 2004. Photo: Paula Smith-Vanderslice Ng, with The White House in background, Washington, D.C.